Steven Bonney, EVP, RecordsOne 2017 is marking major strides in the technology sphere, and many of them are taking place in the healthcare industry. Now health systems using multiple EHRs can seamlessly aggregate their clinical and financial information into a single tool, making it available to multiple disciplines; and with the move to value-based healthcare, it’s quicker and easier to determine which patients need what documentation clarified concurrently. All of this comes at a time when hospitals have a lot to lose. Many systems are boggled down by tight budgets, low-quality outcomes, and unforgiving penalties. At RecordsOne, these times are seen as a call to action, and the newest edition of their R1 platform is a result that sets an industry-wide standard of cost-efficiency and undeniable benefits. With the ability to aggregate documentation, data, analytics, and reporting, the platform stands to eradicate the use of spreadsheets and make document management within the mid-revenue cycle easier than it’s ever been before. “For the first time, nurses and physicians will be able to see the documentation, the notes, and the queries that the CDI department did, not just review post-discharge coding abstracts that often do not portray the entire story. They will be able to make real time quality and compliance decisions in a way that they never have before,” elaborates Steven Bonney, Executive Vice President, RecordsOne. “To me, document management in healthcare isn’t just about managing the documents themselves, it’s about managing the workflow of the entire set of documentation and about creating opportunities for staff to interact with each other about the content of the documents,” continues Bonney. The company’s R1 platform preprocesses all of the data it receives from hospitals, which ranges from highly structured EHR forms to unstructured transcribed reports to structured data, like labs. The data is normalized for processing via natural language processing and computer-assisted coding. The documents as well as key data are then presented to the end users for review, of both the current visit as well as the documents and data for prior visits. Key factors impacting the severity of an illness and risk of mortality for a patient, as well as other risk adjustment factors are presented in the comorbidity history. All of a patient’s historical diagnosis information is available for a nurse or coder to read in easily digestible fashion. Incorrectly coding a secondary diagnosis can cost a facility hundreds of thousands in penalties, by pushing them over a CMS threshold. With the R1 platform,clients can instead manage the lifecycle of their documentation, as well as the query process from CDI and quality, to coding, coding audits through coding compliance to prevent that from happening. The platform can quickly incorporate any changes to coding clinic, which can mean the difference between properly coding hypertensive heart disease versus heart failure with hypertension. R1 creates business rules specific to their client’s needs in facilities within entire health systems, which is made possible by the nSight Formula (rules) engine. One hospital might need to monitor one diagnosis slightly differently than others within the same system. Perhaps more impressively, the platform performs all of this without changing the way that physicians do documentation. Clients have access to tools that identify and map the most important sections within what’s often a three page long patient history and physical record. The platform will process that data, get the right active diagnosis for each patient, present them to the user, and then incorporate the codes into the business rules. The users can also create separate workflow rules for each facility within a health system. R1’s ability to aggregate data from multiple disparate sources, make it accessible, and enable it to be reviewed concurrently, is perhaps its greatest strength. Across 30- 40 critical access hospitals using different systems for their EHRs, a RecordsOne user could set criteria across all of those facilities and generate a list of the 50 most important patients that they need to review for a day, for maybe five or six remote employees. With the move to value-based purchasing, the ability to determine whether or not a patient who suffers from chronic illness is properly documented is essential for appropriate reimbursement. “The idea that you can aggregate all of the EHR data— which could be dozens of different EHRs where you might have several Epic instances, several Cerner instances, and MEDITECH—into one place to do CDI, coding, coding audits, coding compliance, concurrent quality reviews, population health, and analytics, is combined into one platform. That’s RecordsOne. That’s our vision,” elaborates Bonney. Users can keep up with the performance of their respective facilities by metrics of case review rates, physician response rates, and the productivity of their staff. 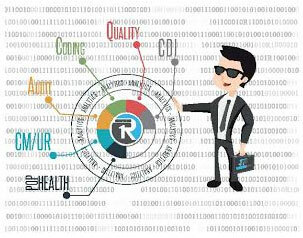 R1 differs from other big data and analytics approaches in its ability to seamlessly move between the CDI module and the analytics. Rather than taking all of its data and retrospectively pumping it into a BI tool for visualization in what’s usually a 30-90 day process, R1 does it while being used, giving users the ability to interact with the data. With the product’s nSight-Driven methodology, the software automatically populates and prioritizes the work pool for quality nurses and CDI people, so the user is always working on the assignment that they’re supposed to. Much of the innovation achieved by RecordsOne’s solutions has been the result of its strong culture. Their first and foremost goal has been to provide a comprehensive set of tools at a really affordable rate while maintaining competitive levels of efficiency. “We feel like we need to do something for the greater good. We need to save facilities real dollars, not ‘pie in the sky’ dollars, but real dollars over what they spend today on their current systems and give them more utility,” continues Bonney. Through fast deployments, easy accessibility to new tools, and a license that has RecordsOne themselves managing the servers, the R1 platform can drive major internal IT cost savings for the client. "Document management in healthcare isn’t just about managing the documents themselves; it’s about managing the workflow of the entire set of documentation"
Another major contributor to the platform’s success is RecordsOne’s partnership with TruCode, who provided their Encoder Essential tools for use. With this advantage, R1 is able to give its users easy access to coding books, coding clinic, coding advice, and all of the reference materials on any diagnosis with a single click. Additionally, nCode, powered by IMO 2.0, translates terms that only coders might understand into more familiar ones for physicians and nurses. Where you normally wouldn’t find anything in a codebook for the term “status post cholecystectomy,” nCode can map it directly to a code. “Computer-assisted coding isn’t going to do a great job at identifying all those codes really accurately, so having nCode allows a coder or even a CDI nurse to get to the correct one much more quickly. It’s not a CAC benefit, it’s a benefit of the platform,” comments Bonney. With their updated R1 platform, RecordsOne has managed to accomplish a lot. Among those accolades is the work they did for their biggest client, who has dozens of hospitals across the country. Between 20 hospitals, the client was using two different Epic environments, six different MEDITECH environments, as well as a Sorian environment—9 different EHRs across 20 facilities. With RecordsOne’s CDI tool, they were able to outperform all of the other regions and merge the data of those EHRs seamlessly, giving them better financial outcomes and review ratings. To this day, they’re able to make real-time auditing and compliance decisions in a way they never could before. With the straightforward success of their platform, it’s no surprise that RecordsOne is continuing their transition into predictive analytics. One of their goals is to concurrently notify population health managers of whether or not their patients may be in a problem group, so that the patients can take action and seek out a better care plan before they leave the hospital. With their ability to marry coding and clinical data together, RecordsOne has made strides in the development of this technology, and will only continue to improve upon it in the future.